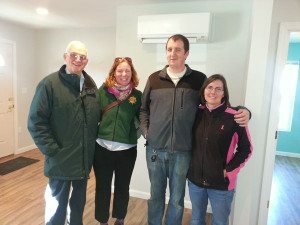 Left to right: Lin Lufkin, site manager, Jen Albee of ReVision Enery and homeowners Shawn and Amanda Umble celebrate the opening of the Umble’s home. Photo courtesy Habitat for Humanity Greater Bangor. ReVision Energy has been honored to be part of several Habitat for Humanity projects over the years, the earliest in 2008 (where we installed solar hot water for a home in Portland, the first Habitat LEED home in the area) and again in 2010 (installed a high-efficiency boiler for a home in Freeport) and most recently, where we installed a solar PV system to help a new energy efficient home in Bangor power much of its energy needs. The home, destined for the Umble family, was wrapped up just in time for the Thanksgiving holiday. The 3kw PV system donated by ReVision Energy consists of 12 Q-Cell 260watt panels, and should produce around 3,100 kilowatt-hours of electricity each year. If used for heating, those 3,100 kilowatt-hours will provide the equivalent of roughly 300 gallons of oil each year, cost and carbon free, for the Umble family, for 25+ years.